You'll be £12.99 closer to your next £10.00 credit when you purchase Stuka Spearhead. What's this? Order within the next 4 hours, 21 minutes to get your order processed the next working day! This superb illustrated series books charts the rise and fall of the German Air Force from 1939 to 1945. Each volume makes use of over a hundred rare and valuable photographs, many of them taken by Luftwaffe personnel, to bring history to life and record both the men and the aircraft they flew. The Ju 87 Stuka dive-bomber dominated the opening campaigns of World War II. It was a primary weapon of German Blitzkrieg tactics and the concept of lightning warfare. Together with the panzer, it transformed air and land warfare, with countries falling in days and weeks, rather than after campaigns lasting years. 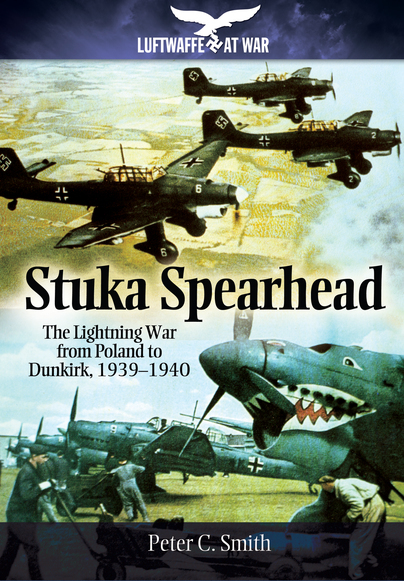 With more than 100 photographs and detailed commentary Stuka Spearhead profiles the various models and infamous tactics of these deadly dive-bombers from the conquest of Poland and the Norwegian campaign, through the invasion of the Low Countries, to the fall of France and the evacuation at Dunkirk. Though the grainy color photos won’t settle many arguments about proper painting, they are nevertheless fascinating. A bountiful source of diorama and display ideas, the 100 photos show the Stuka up close in candid poses. Modelers in search of that “one” detail may well find it among these shots. Many of the images are from private archives or from the Federal Archives and were until now not yet published. Part of a series which covers the history and the aircraft of the Luftwaffe during WW2, and one of a number on the series to tackle the Stuka. This one looks at its use in the Blitzkrieg period, from the invasion of Poland in 1939 to Dunkirk in 1940. So the early marks of Stuka in the days when it made a reputation for itself. The first four pages are text to give the background to the rest of the book, with over 100 archive photos of the time. This is followed by eight pages of wartime colour images and then the remainder of the book is filled with black and white photos, all of them provided with informative captions. The mix of pictures is excellent, as they include the Stuka in flight, approaching their targets, on dispersal at their airfields, undergoing servicing, such as engine changes, close-ups showing crew along with their uniform details and in some cases with detail of personal markings applied to some aircraft. Some of the photos show wrecked Stukas, some from 'nosing over' on landing, which apparently was not uncommon, and others which have been damaged in combat and not quite been able to make it back for a safe landing at their base. Following the period covered by this particular title the Stuka came in for some rougher treatment at the hands of the RAF during the Battle of Britain, but that is another story.